It was great, after nearly a week, to sleep in our own bed last night. Last night would have been considered a bad night's sleep six months ago. However, after the sleep we've had in the past few months it may have been one of the better nights in a while. I have the sneaking suspicion that all of this will seem comical in a week's time when there are two other little gentlemen sharing this apartment with us. Today we went to the hospital for the 12:00 PM and 3:00 PM feedings and joined the guys in the NICU. They had a bit of a role reversal. Elliott slept for the first time while Jen fed Martin. Normally she prepares to give Martin his first shot at going first and just as she's about to do so Elliott freaks out and she takes him first. Martin also was a more enthusiastic eater than his brother today who had to be tricked and coaxed by his nurses to finish his formula. If they can somehow manage to stay awake long enough to eat just a little more there's a good chance they'll be coming home soon. 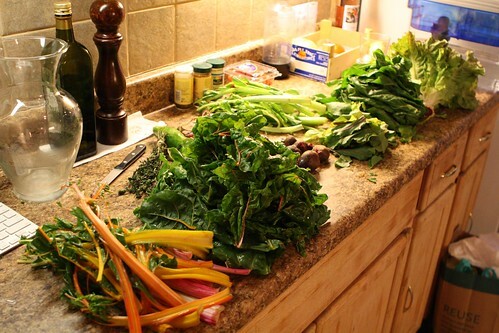 When we finally got home and Jen collapsed from exhaustion I took out a bunch of the greens we had building up in the fridge, cleaned, stemmed, and threw them into a pan for dinner. 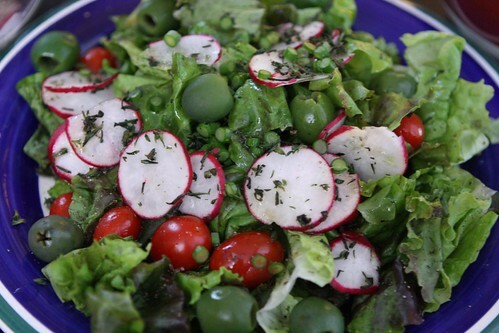 I made a red leaf lettuce with garlic scapes, green tomatoes, thyme, lemon, olive oil, salt, pepper, and radishes. 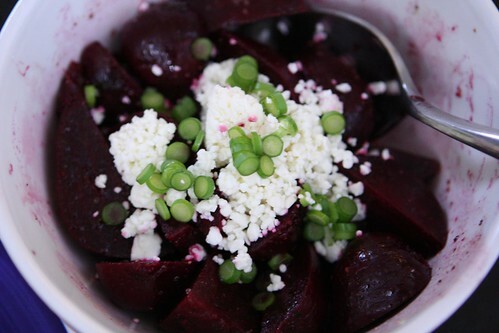 I cooked the farm beets and tossed them with olive oil, balsamic vinegar, salt, pepper, and garlic scapes. 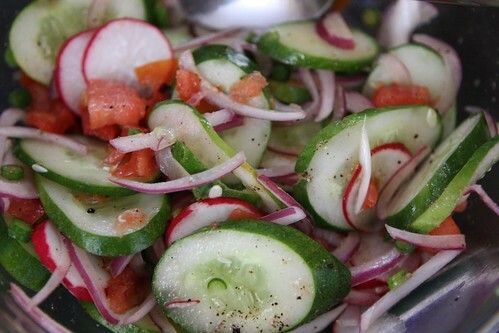 With the cucumbers I sliced them up with red onion, tomato, radish, sesame oil, rice wine vinegar, cumin, a splash of hot sauce, salt, and pepper. I didn't have any since I hate cucumbers but it got pretty good reviews from the ladies. With the greens I browned up some crushed garlic in olive oil and butter, tossed in some sliced vidalia onion, and finally the chopped stems of the greens. 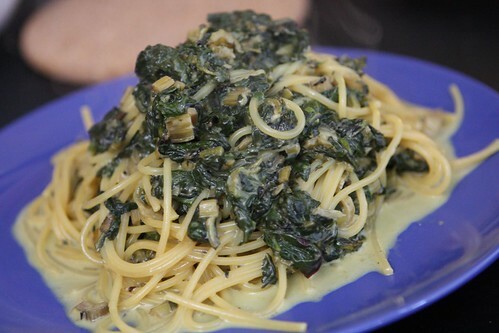 I cooked those down for a bit then added the rough-chopped greens, salt, pepper, thyme, milk, heavy cream, and a dusting of nutmeg. After it reduced down I threw in some cooked spaghetti and grated gouda cheese. 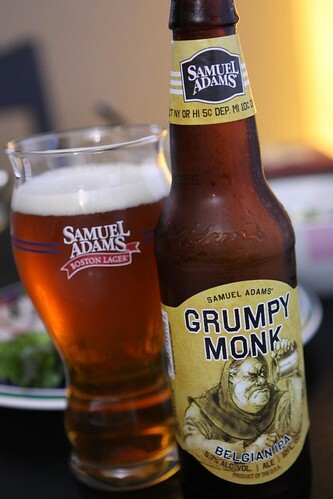 In honor of my two boys I had this Grumpy Monk beer, the final beer in the Hopology series from Sam Adams. This was a very nice Belgian IPA and a fitting tribute to my two grumpy monks. Actually, Martin is pretty content but Elliott is fairly grumpy. I will have to look for a Martin-appropriate beer sometime in the near future. I think Sam Adams should brew a beer called Content Monk so that I can better celebrate the temperamant of my other son! C'mon, Sam Adams! Why isn't it all about me? Labels: babies, beer, Dinner Guests, How'd we use it?